This week, the city of Liverpool are celebrating 100 years since the ‘Royal Liver’ building first opened its doors. The Royal Liver building is considered to be the first Sky scraper in Britain, and foundation stone thereof was laid on 11th May 1908. When I first saw the building, it made me think that its design had a lot in common with the Salt Lake Temple, a recognised symbol of The Church of Jesus Christ of Latter-day Saints. Both buildings are of a traditional Victorian Gothic design, with towers at either end. The Salt Lake Temple was designed during the 19th Century, by the architect Truman O. Angell, under the direction of the Church’s then President and Prophet Brigham Young. Truman Angell was sent to Europe to study the works of the architects and builders over previous centuries. 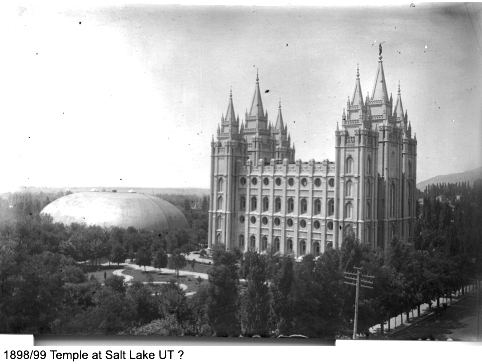 The groundbreaking ceremony of the Salt Lake Temple took place on 14th February 1853, and it was completed on 6th April 1893. The Royal Liver building was the purpose built home of the Royal Liver Assurance Group, an organisation set up to provide local people with in relation to losing a wage earning relative. Today it still stands proud, “the most potent symbol, that any city in the united kingdom has”. The Royal Liver stands 13 stories tall, whereas the Salt Lake Temple is approximately half of that. Another similarity between the two buildings is the sculptures that stand at the top of the towers. At the top of the Liver Royal, at either end sculptured are the Liver Birds, an image which has represented the city since the fourteenth century. On the east, and main spire of the Salt Lake Temple stands the statue of Moroni with a trumpet pressed to his lips. Moroni was an ancient prophet, who played a key role in the restoration of the LDS Church during the early 1800’s. The trumpet symbolises the restoration and the preaching to the world of the Gospel of Jesus Christ. What I really like here is the similarity between the two buildings, in other words the architectural similarities that are present in both designs. While the Salt Lake Temple was designed first, and while it is every bit possible that it may have been a source of inspiration for the architects of the Royal Liver, I don’t for one minute think it was copied. Both buildings are patterned after a gothic style, and it shows a real ability in the architects to both come up with something new, and keep the tradional, much appreciated and loved styles that bring value and class to all city scapes. It has always been a part of a designers work to seek inspiration for new ideas from the fine masterpieces already present, to develop those designs in to even newer, more spectacular and more impressive constructions. For the Church especially, it shows how well they have kept in line with fine Eurpoean achitectural principles, and how the construction of a religous building can both be kept symbolic, in-line with the beliefs which that organisation holds, and also a fine masterpiece that people can look at and enjoy being around. Images used within this article are property of their respective copyright owners. This entry was posted in Photos and tagged architecture, design, LDS, Liver Royal, Liverpool, Salt Lake. Bookmark the permalink.